In anticipation of my new novel, Dickinstein, due out from Rocking Horse Publishing in October, I recently sat down with the two people who inspired me to write this book: Emily Dickinson and Frankenstein. In case you didn’t already know, the book is a mash-up of Emily Dickinson’s life with that of the novel Frankenstein by Mary Shelley. What follows is Part One of my interview with them. Enjoy! And check back often for more details about my novel! Shannon: Hello, Miss Dickinson and Mr. Frankenstein. First, let me start by saying it’s such an honor to be sitting here interviewing you today. I really appreciate your time. Emily: Thank you, dear Shannon. Please call me Emily and this shall be the introduction to a wonderful visit with new and honorable friends. Shannon: Well, thank you for saying that, Emily. 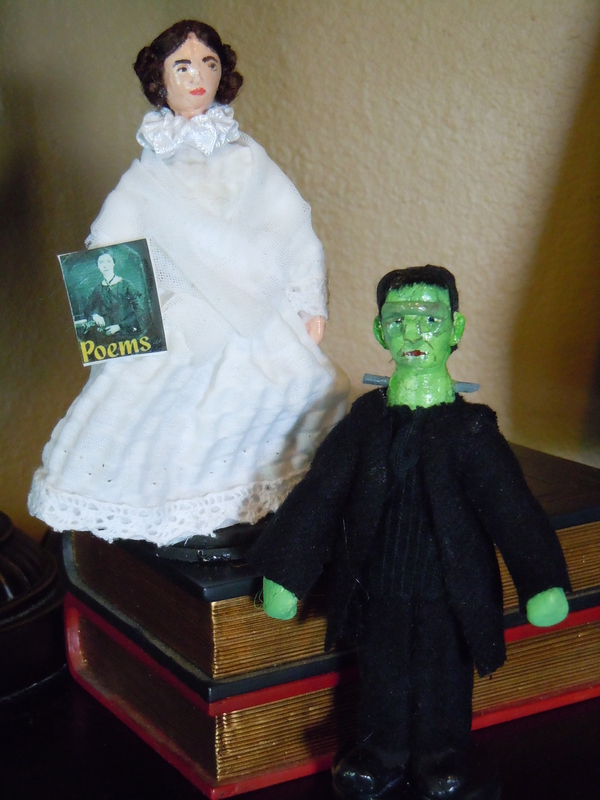 And what about you, Frankenstein? May I call you Frank? Shannon: Great! Now, I recently let both of you read the manuscript of Dickinstein. Do you care to enlighten us with what you thought about it? Emily: May I be Frank? Emily: I do apologize, I meant may I be honest? Shannon: Oh, absolutely! Good or bad, I’m completely open to your criticism. Emily: Being a novel, I thought it was a wonderful and true portrayal of the non-fictional parts of my life that were not true. Shannon: Okay, so you liked it. That’s good. And what about you Frank? What did you think of it? Shannon: Now you each have books of your own that have never gone out of print and are available in several different editions. What kind of advice would you give to other aspiring authors out there who are considering publication? Emily: Do it before you die. Shannon: Frank, do you mean that the publishing industry is dead or are you just referencing the fact that you are actually made of dead body parts? Shannon: Alright then, moving on. Emily, other than letters, you wrote mostly poetry during your lifetime. Any advice for our poets out there? Emily: A poem is a living, breathing essence born of the love and the anger in our soul. Bring it forth upon the world or it shall smother inside and surely die and linger like the husk of the moth hanging in the black spider’s web, or a ghost in the hallway veiled in mystery. Shannon: Frank, any advice or thoughts on poetry that you’d like to share? This concludes Part 1 of our 3 Part interview with Emily and Frank. I hope you enjoyed it. Check back soon for Part 2! Shannon, we put this up on our page for “The Secret Life of Emily Dickinson” – today is Wednesday, our Anything Can Happen Day, and this interview will make a big splash. Thanks, and do come visit. Hi Lenore- What’s the link where I can find this?